Being fitted for a retainer usually happens on the same day your braces are removed. After your teeth are thoroughly cleaned, we will take another set of X-rays and pictures, to check how well your braces worked and to see how much your wisdom teeth have developed. Then, we'll discuss your retainer and start getting it ready. 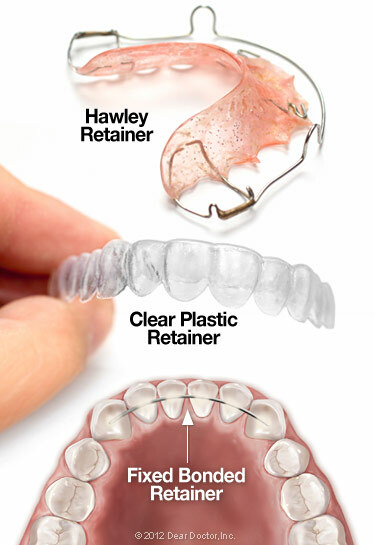 Another popular style of retainer is the clear aligner-type, which looks similar to the Invisalign® tray system. These retainers are custom-made of thin, transparent plastic which is designed to fit precisely over your teeth. Their main advantage is that they're invisible, with no wire to show. These retainers are also easy to remove. They aren't recommended for patients with certain conditions, like teeth grinding. In this case a night-guard will be recommended. To stay fresh and germ-free, all retainers need proper cleaning. All retainers can be brushed gently with a regular toothbrush and hand soap — but toothpaste should be avoided as it causes scratches that allow bacterial growth.. Denture cleaners, in powder or tablet form, as well as special retainer cleaners, can be used to clean most removable retainers. Fixed retainers are cleaned by brushing and flossing; a floss threader or interproximal brush can also be a helpful cleaning tool when needed.